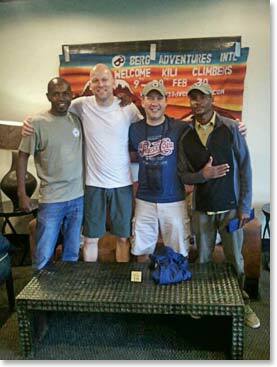 Kilimanjaro Dispatch: February 10, 2014 – Danny and Hendrik Arrive in Arusha! We spoke to Berg Adventures guide Arnold in Arusha today and he said that Danny and Hendrik have arrived in Arusha and were enjoying a relaxing day at the Mount Meru hotel. By the photos you will see they are doing great! 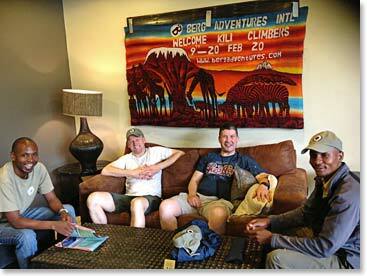 They are happy to be in Arusha and to have met their Berg Adventures guides Emmanuel and Joseph. Tomorrow the team will drive to the park gates where they will begin climbing Kilimanjaro along the Umbwe trail. Their climb will begin in the beautiful old growth forest. They are excited to enjoy a quiet and scenic first day on the mountain! Stay tuned for more stories and photos!